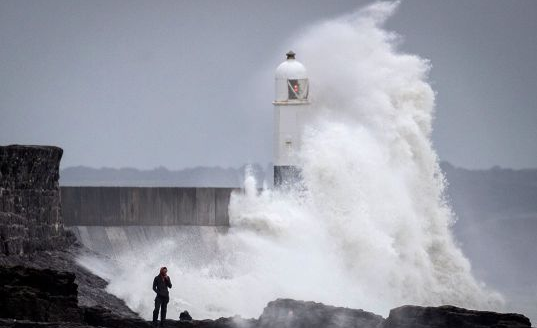 life’ with winds reaching up to 80mph in parts of the UK today. Forecasters said there is now a high likelihood of impacts from the storm, as it extended the area covered by the amber warning. ‘Flying debris is likely and could lead to injuries or danger to life,’ a Met Office spokesman said. Damage to buildings, power cuts and travel disruption is also likely. The strong winds may blow tiles from roofs and cause damage to properties from falling trees, the Met Office said.